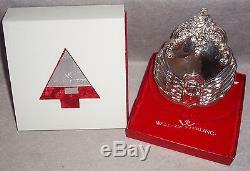 2001 WALLACE FIRST ANNUAL GRANDE BAROQUE STERLING SILVER ANGEL ORNAMENT. First Edition From The Wallace Showroom. Received in a large collection from a former Wallace VP as showroom display, so it is in as new condition. 2001 Wallace sterling silver angel ornament inspired by their Grande Baroque flatware pattern. Start a new collection as a thoughtful gift for a collector, newlywed, or for yourself with this First issue sterling ornament. Introduced in 1941, it captures classic symbols of the Renaissance in the exquisitely carved pillar and acanthus leaf curved as in nature. The sculptural, hand-wrought quality is evident in the playful open work and intricate, three-dimensional detailing. Crafted in sterling silver, this beautiful 1st edition Grande Baroque Angel makes the perfect tree ornament. If by some small chance your item is not satisfactory, your return should still be received within 7 days or less. Be sure to check my other listings for many Christmas sterling pendant /medallion / ornament / charms, and other great gift items, Victoriana, Elegant Glassware, Vintage Clothes and Shoes etc. The item "2001 Wallace FIRST Annual Grand Baroque Angel Sterling Silver Christmas Ornament" is in sale since Friday, May 03, 2013. This item is in the category "Collectibles\Holiday & Seasonal\Christmas\ Modern (1946-90)\Ornaments\Metal".